This is the week I finally start bringing everything into the Unreal Engine. In prep I’ve been doing some house cleaning (file organization…etc). Additionally, I’ve been building elements to populate the interior. During Ranke’s dig, sections from two statues were found in the first pillar hall. Both statues were largely damaged. Statue one consisted of the hips, torso, and head. The right hand looks like it is holding an Anhk, the left arm and legs are missing. The majority of the face is missing, their might be an indication of a small false beard, but it’s really to difficult to tell. Statue two is essentially the hips and right leg. 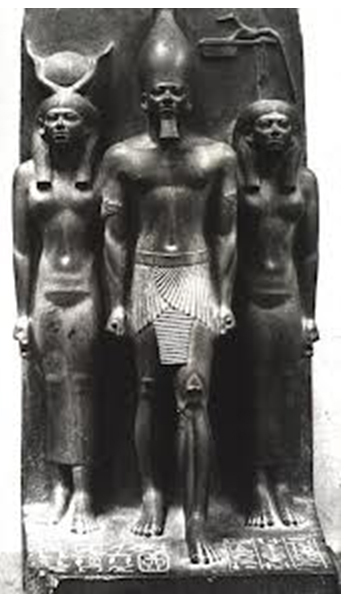 The belt and wrap are similar to statue one, leading me to speculate that these statues were a pair. The overall heigh is a little difficult to judge. Statue two was photographed on a odd angle with a yard stick. and the other was surrounded by boot prints. It’s a guess, but I appears these would have been close to life size, around 5 feet high. Before building, I studied similarities and differences between a variety of statues. I was surprised to discover that these statues were not truly free standing, They seemed to be more of a dimensional relief, as if they were stepping out of the blocks they were chiseled from (I realize that’s not the symbolism). I began with a default human mesh in Zbrush, which gave me quick proportions….although these had to be heavily modified. The base and ankh were modelled in maya. And the final was sent to Substance Painter for detailing.